Pick up today or have items shipped to you quick! LIMITED TIME OFFER! OWNER'S SPECIAL! Includes All Hardware Needed To Install The Axles. 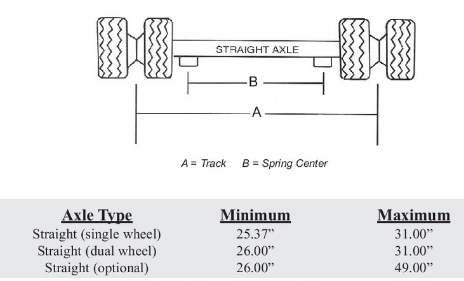 30k Triple Axle Tire Wheel Bundle Can be Picked up at Trailer Parts Unlimited's Distribution Center Located in Huntsville Texas or You Can Have Items Shipped to you Quick. Our larger products are shipped by a common freight carrier. You (the customer) will need to have the product delivered to a commercially zoned address, a place that a 53 foot semi trailer can easily access. You (the customer) will need to provide the correct equipment to unload your purchase. If you do not have a loading dock, then you will need a forklift, skid steer, or some similar type of handling equipment to unload the purchase. You (the customer) can also pick it purchased items at a freight terminal around your area. Call Christina or Kaleb for any questions, shipping quotes, other packages, wholesale and manufacture prices!